STOP PRESS: Collins Academic Skills Series including GROUP WORK wins British Council ELTons award! 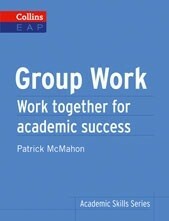 Group Work: work together for academic success is a new book written by Patrick McMahon (yes, the writer of this site!) for international students who are studying at English-speaking universities. The book gives students the skills they need to work well with others, and helps students feel confident in contributing to group projects at university. Through practical exercises and real-life case studies students will learn how to form effective groups, assign roles, establish rules and deal with difficult group situations. It's part of new six-book series published by Collins to help international students achieve academic success at college or university. The other books in the series are: Lectures, Numbers, Presenting, Research, and Writing. If you are a student and you use the book, please let us know if you like it!